In the years that I volunteered at the Charlotte Maxwell Clinic, I was blessed with the task of supporting women through their breast cancer treatment. It was a wonderful experience and it was amazing to see how much the acupuncture helped women feel both emotionally and physically better during a very trying time in their lives. When I went to China for two months during my acupuncture study program, I often had congee for breakfast. It was so warm and nurturing. It makes you feel great. It is kind of like having a hearty chicken soup, but the rice in it makes it more filling and satisfying. 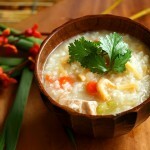 Check out this article about congee posted by Three Stone Hearth. Three Stone Hearth is a wonderful store in Berkeley where you can buy wholesome, nutrient dense meals and bone broths. It is very good for people in a hurry who don’t have time to prepare substantial meals. Congee is one of those “foreign” foods that deserves to be as well known in the U.S. as hummus and salsa. Congee, also known as jook, is a savory porridge usually made from long-simmered rice. Eaten extensively throughout East Asia–often for breakfast–congee is universally celebrated for its digestibility and restorative properties. The first mentions of it in Chinese texts date back at least two millennia. It is often the first food fed to a baby after months on a diet of pure mother’s milk. If you are ill, elderly, or infirm you will be plied with congee. There are endless variations on this classic healing food. Sometimes it is very plain, other times it is dressed up with meats, eggs, herbs, or vegetables. These may be stirred in, sprinkled on top, or served on the side so that eaters can customize their congee to their heart’s delight. 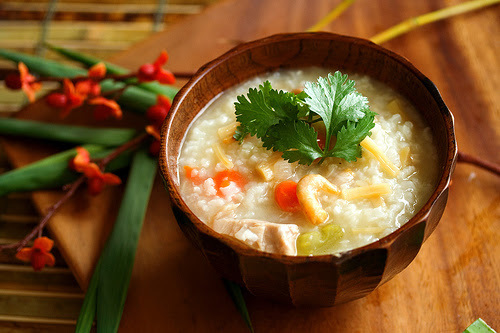 Congee can be made with other grains instead of rice, like millet or barley, and it can also be cooked with traditional medicinal herbs to enhance its healing properties. There are also ceremonial forms of congee, such as Laba, which is eaten on an annual festival day (the eighth day of the twelfth month of the Chinese calendar) and often includes dried fruit or beans. So… why isn’t congee yet a household word in America? Not quite a soup, not quite a stew, congee is a savory breakfast porridge eaten with meat and vegetables trying to make it in a culture that has a limited imagination when it comes to breakfast foods. We think of sweetened cold cereal or eggs and toast. But for those of us hungering for nourishing, easily digested, warming meals, congee is deeply satisfying. It’s great for lunch and dinner too. Check out this week’s Pork Congee with Shiitakes and Tatsoi. Then try making your own —maybe with some Three Stone Hearth bone broth. And if it clicks–spread the word! Heir foods are great for anyone in a debilitated state such as someone post partum or post surgery.